I will explain in this article how to reverse a given string in a Windows console application using C# without using a function. This type of question might be asked by an interviewer in a .Net position related interview. My intent for this article is to explain how to answer a question that is often asked in an interview, which is: Write a program to reverse the given String without using the string function. A candidate new to the interview can become totally confused because the first problem is the candidate just thinks about functions, not other techniques to reverse a string. What is a String ? A String is a sequence of characters enclosed within double quotation marks. "vithal wadje" , "C#" , "Mumbai" "Five hundred" etc. I hope you understand about strings now. 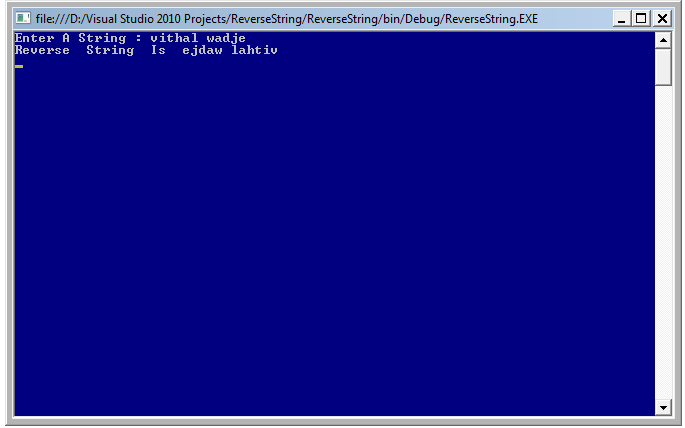 What reversing String Means ? To change the position of charters from right to left one by one is called reversing a string. Then go to to "File" -> "New" -> "Project..." then select Visual C# -> Windows -> Console application. After that specify the name such as ReverseString or whatever name you wish and the location of the project and click on the OK button. The new project is created. From the all examples above I have explained how to reverse the string. I hope this article is useful for beginners and anyone preparing for an interview. If you have any suggestions and feedback please contact me.